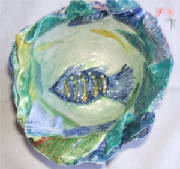 In September 2007 I began learning how to make hand-crafted ceramic objects with my colleague Maria Teresa Ronca, who also belongs to Route des Arts and Arts Morin Heights. Since then I divide my creative time between Print-Making, Ceramics and Painting. 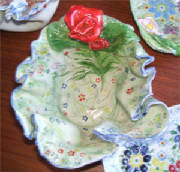 My ceramic objects include bowls and vases done following the techniques used by Maria Teresa Ronca. 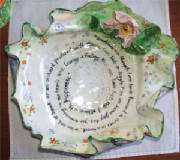 However, many of my ceramic objects are designed for use during Jewish Holidays.